I love banana bread, it is the ultimate quick bread, and this recipe, if you don't tell, no one will know it is a gluten-free banana bread! Sometimes recipe testing can be trial and error, sometimes it's a big old fail. 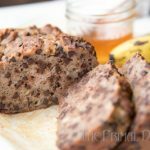 This recipe was perfect straight out of the gate, and is the World's Best Gluten Free Banana Bread! I almost didn't believe it! Every time I have made it since it has been perfect! 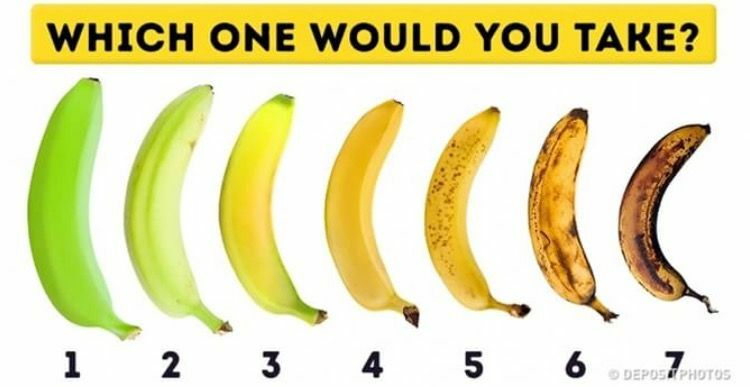 What is your ideal banana eating ripeness? Personally, I am a fan of the 2-5 range. My friend Brooke loves the 6-7 window. I am a hopeful banana buyer. You know how it goes, fresh-faced and full of vigor when I'm grocery shopping. I am going to cook and prepare all my meals this week! I'm going to make all my sauces from scratch and create elaborate tasting dishes every day after work. I won't once stop at Starbucks (I know…) or go for sushi or Indian food. The day I go grocery shopping I cook, even a couple days after, but then I end up working late, I don't pack enough food, or I have a poor sleep and I'm craving caffeine and sugar. By the end of the week all that beautiful produce I invested in is starting to look sad and neglected. The giant bunch of bananas is slightly bruised and browning – too far on the chart for my eating enjoyment. Once you get too far… what do you do with those sad bananas? Smoothies are great' I like to peel and freeze those bananas for pancakes sometimes, but my personal fave is banana bread. It's something my mom made often, as she too was a hopeful banana buyer. We have made a variety of banana breads the past few years, even a savory banana garlic loaf! We have even gotten creative with a dynamite banana scrambled eggs!! 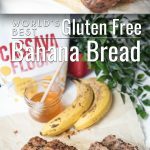 It can be tricky to find cassava flour so that you can also make this nut-free worlds best gluten-free banana bread, we order ours here. I suggest you find a good local honey producer, raw honey is the secret weapon in this bad boy! 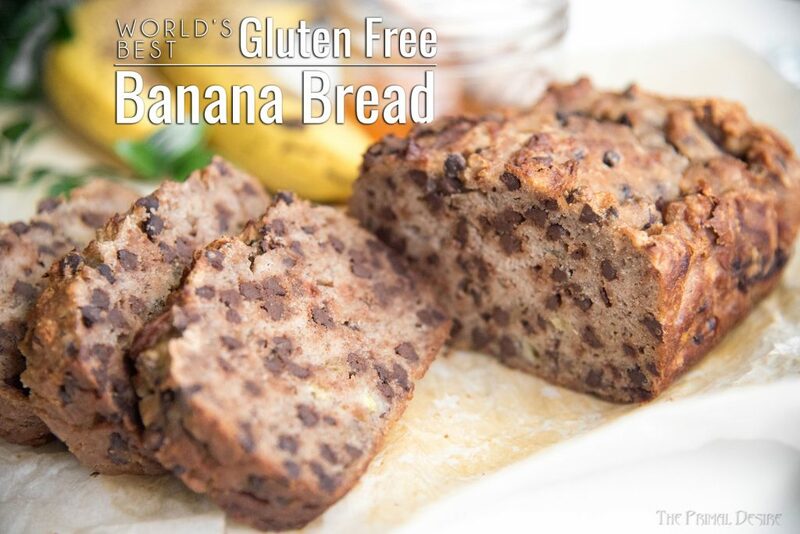 World's Best Gluten-Free Banana Bread is as good as the old tried and true recipe. Well, in my opinion, this recipe can't be beaten! I love banana bread, it is the ultimate quick bread, and this recipe, if you don't tell, no one will know it is a gluten-free banana bread! Sometimes recipe testing can be trial and error, sometimes it's a big old fail. This recipe was perfect straight out of the gate. I almost didn't believe it! Every time I have made it since it has been perfect! In a mixer combine: ripe banana's, butter, honey, eggs, and vanilla, mix until all ingredients are blended. Shut off mixer and add: flour, baking soda, salt, coconut milk and chocolate chips, mix until JUST combined (don't over stir). Spoon into a parchment lined loaf pan and bake for 55 minutes, or until a toothpick comes out clean. Let cool in the pan for 20-30 minutes then remove from the loaf pan. You can use just half the bag of chocolate chips if you don't want as much chocolate. « Breakfast Salad with Sausage – And Probiotics! Would you use the same amount of almond flour in place of cassava flour? Hi Ruth! Cassava flour substitutes into recipes 1:1 You may need to blend the almond flour with tapioca, or arrowroot, and I’m not sure the exact measurements for that. Can I use tapioca flour instead of cassava flour? What is the difference? Tapioca flour likely will give you a different texture, It may work, it may be too soft, I’m not sure as I haven’t tried this recipe with Tapioca. Made this today with some variations. I used almond flour. I substituted dried cranberries and walnuts for the chocolate chips. Very moist and tasty. Thank you, Holley! I am so glad it worked with the almond flour! It is by far my new favorite banana bread! I’d like to make this but I need to be dairy free. Can I substitute organic palm oil shortening? you could! Or plain old coconut oil would do the trick as well! Can you omit the honey? Sub butter for coconut or olive oil? Heck yes to all of the above! It will change the taste, but bananas are usually sweet enough to omit the honey, and whatever fat you most like to use will work, it may change the texture a touch as well.